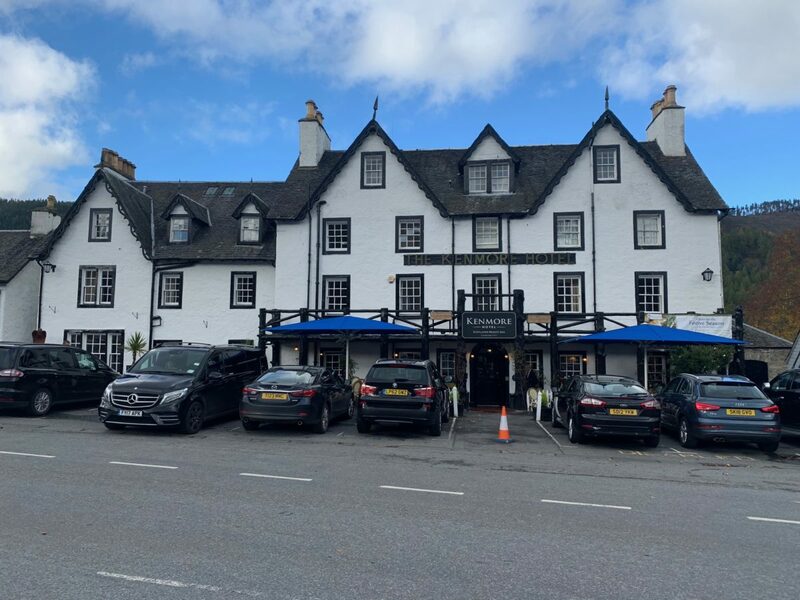 Are you getting married and having your wedding reception in Kenmore, if you are you’ll probably have chosen Kenmore Hotel with its stunning function room overlooking the River Tay. 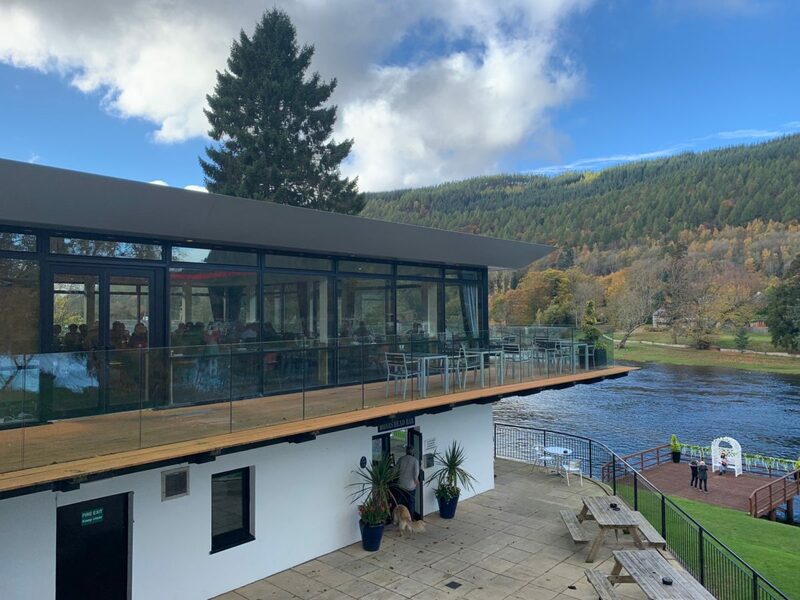 Kenmore Hotel’s stunning function room and great views over The River Tay. Kenmore Hotel’s stunning function room with beautiful view. I have done lots of weddings in Kenmore Hotel and it’s a venue I really enjoy being the wedding Dj at. 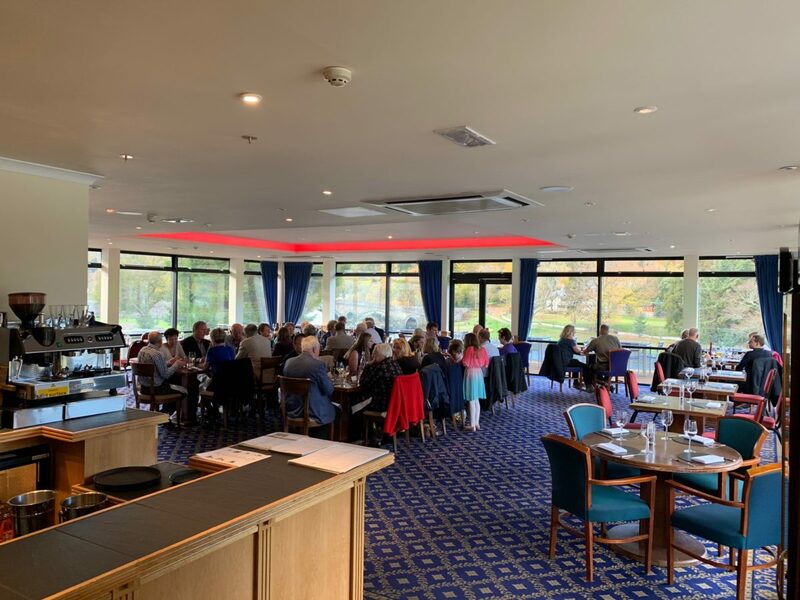 The function room is beautiful and fairly large and has full length glass windows on three sides which gives you panoramic views out over the River Tay. 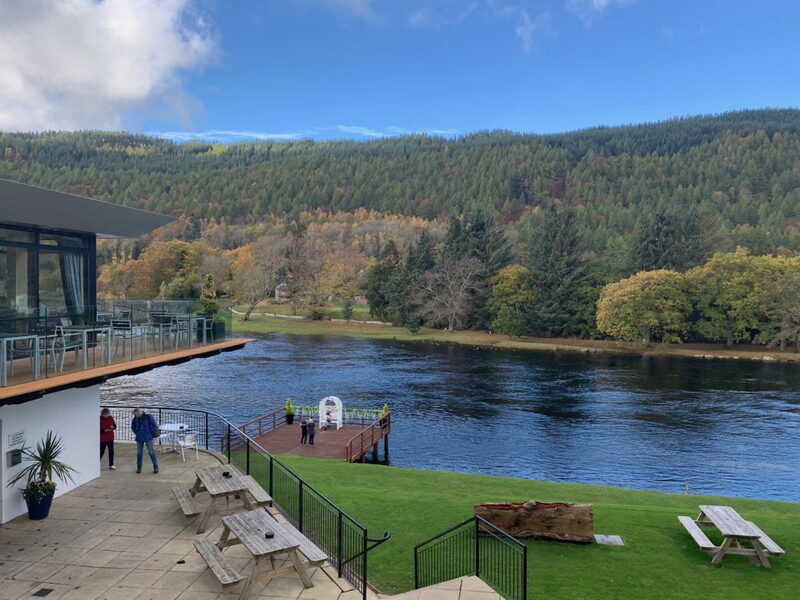 It is a beautiful view with the bridge going over the River Tay on your left and the river flowing directly in front of you from left to right. The function room also has a large veranda on three sides that is lovely to walk on or sit in a chair and admire the breathtaking view. The Hotel is situated in the square in Kenmore and is only a few hundred yards from the church at Kenmore. 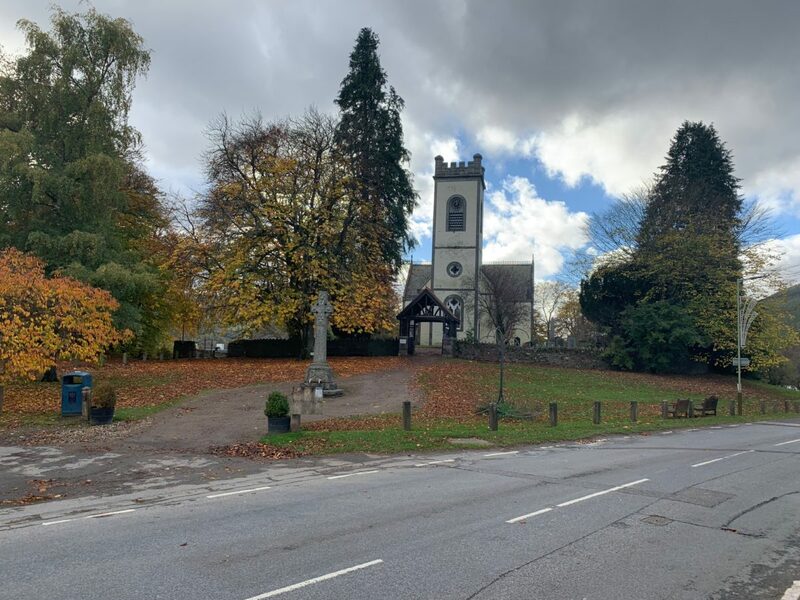 The church is very beautiful and in lovely grounds and as it’s so close to the Hotel it’s also very handy for getting from your ceremony to your reception and wedding breakfast. The local church which is only a few hundred yards from Kenmore Hotel. 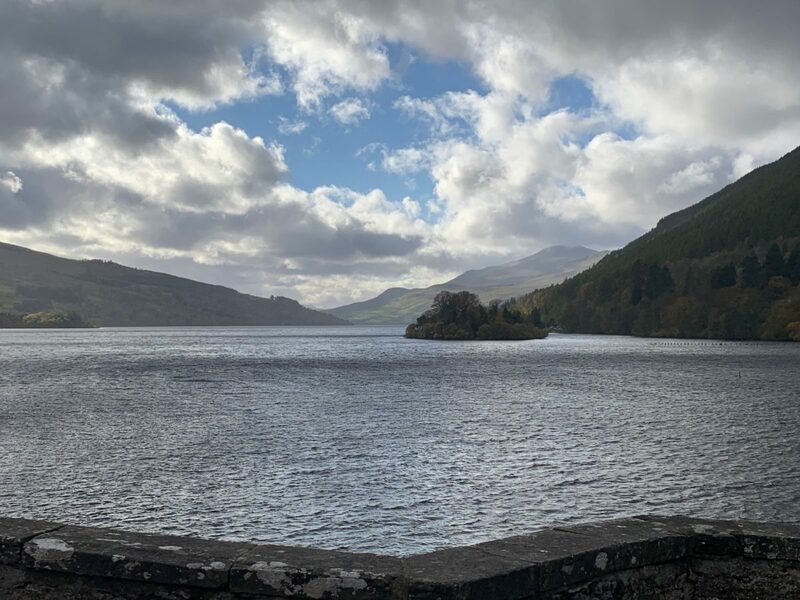 Kenmore is fairly easily to get to and is only 17 miles from the A9 at Ballinluig and takes you through Logierait, Grandtully, Aberfeldy and then Kenmore. When leaving Aberfeldy and heading towards Kenmore you have two possible routes. You can go on the North side of the River Tay or the south side of the River Tay. Either way is good but the advantage in going on the north side is crossing General Wade’s Bridge which is a stunning piece of engineering. You then go along poplar avenue which has poplar trees on both sides which were originally planted to celebrate Queen Victoria’s diamond jubilee. Recently they were re planted as the original ones died through disease and were cut down. 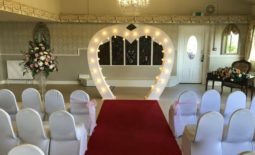 Kenmore is a beautiful location for a wedding, it’s very tranquil and romantic and has all the amenities you’d expect from a small village. It has a village shop and post office and a fantastic beach in the summer which is great if you’ve got children as it’s shallow for well over 109 yards and gets nice and warm in the summer. You can hire boats and go for lots of amazing walks or drives in the country. 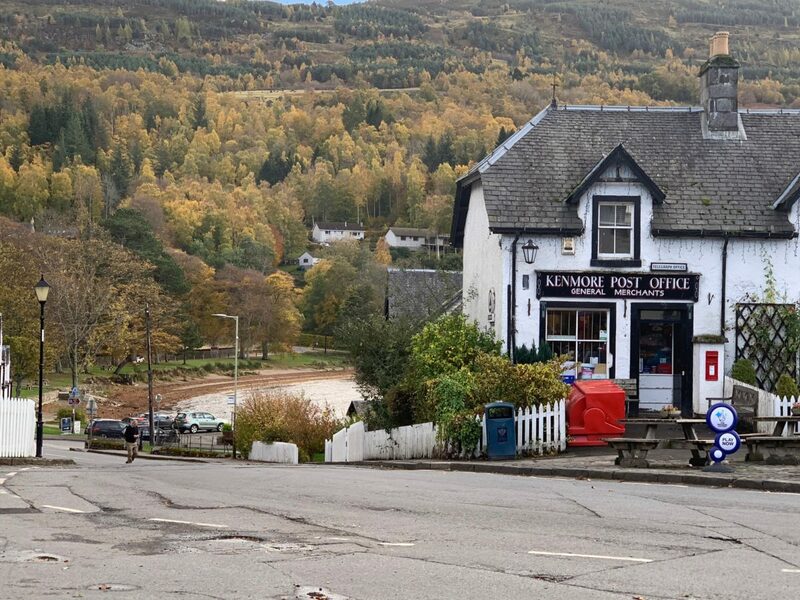 The local shop and post office opposite Kenmore Hotel and the beautiful beach in the distance. At the other end of Loch Tay, around 17 miles away is Killin and it has one of the most photographed sets of rapids that look amazing in the winter especially when it’s been raining heavily! The difference is amazing compared to the levels you get in the summer. Also close to Kenmore is Fortingall with its ancient yew tree and the birthplace of the now notorious Pontius Pilate. Yes that’s a fact. The ancient yew tree is apparently the oldest tree in Europe. Kenmore is right in the middle of Perthshire which I think is my favourite county in Scotland but I may be a bit biased as I grew up in Aberfeldy and my Dj career started here too back in 1976. The Hotel has lots of car parking, lots of nice rooms and a great restaurant. Weddings at the Hotel have always run very smoothly with a very efficient function manager and great staff. The guests love this hotel due to its location, views and friendly staff. 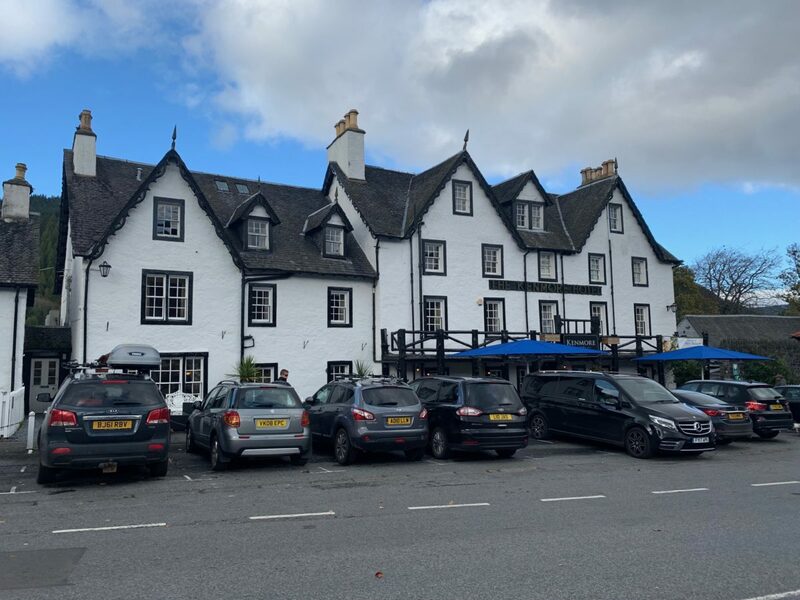 As a mobile Dj who visits hundreds of venues throughout Scotland and Northern England I have to say that The Kenmore Hotel is one of my favourite venues! 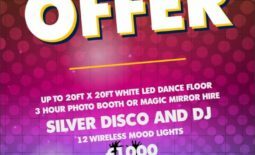 I also supply white LED dance floors, photo booths, giant letters and much more. My website and Facebook page have lots of information. I hope you’ve found my blog post interesting and if you’d like any help or advice please don’t hesitate to contact me. With 43 years as a wedding Dj I’ve travelled extensively throughout Scotland and quite literally done discos at weddings in thousands of venues and I’m still finding new ones! I’ve recently started doing discos in Northern England too as far down as the M62 corridor. I’ve several favourite venues that I particularly like going back to and this hotel is one of those. Here’s one last picture and one of my favourite views, looking up Loch Tay towards Killin and Ben Lawers, Perthshire’s highest mountain at 3,984ft. The view from the bridge at Kenmore which is a very short walk from Kenmore Hotel. 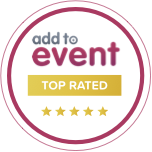 Keavil House Hotel | Weddings| Crossford	The top 10 dance floor hire questions.